For Energy, Well-Being and Immune Support! 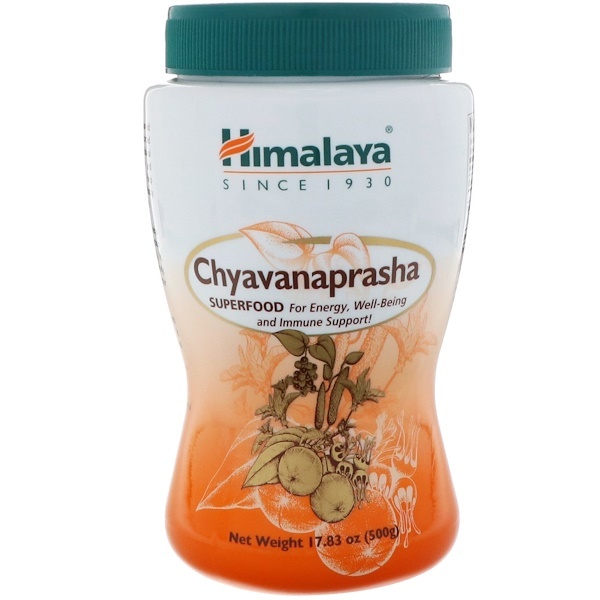 Chyavanaprasha, a 2,000 year-old recipe, is one of the oldest recorded superfood formulas used in traditional Ayurveda. It has been safely and effectively used for years to help promote youthfulness of mind and body, physical vigor and emotional vitality. Himalaya's Chyavanaprasha helps support proper immune system function and provides overall well-being. It rejuvenates and nourishes your body, provides energy and vitality, with better digestion and metabolism. Chyavanaprasha's adaptogenic and antioxidant properties have made it one of the cornerstones of traditional herbalism. Amla [fruit], cane sugar, purified water, clarified butter, arrowroot [rhizome], long pepper [fruit], malay bush beech [stem], shatavari [root], grape [fruit], ashwagandha [root], cardamom [fruit], cinnamon [bark], solanum anguivi [whole plant], yellow-fruit nightshade [whole plant], malabar nut tree [aerial part], air potato [tuber], potassium sorbate [preservative], sodium benzoate [preservative], indian cassia [leaf], mesua [flower], oroxylum [stem], tribulus [fruit], heart-leaf sida [root], phyllanthus [whole plant], leptadenia [aerial part], indian elecampane [root], chebulic myrobalan [fruit rind], indian tinospora [stem], spiked ginger lily [rhizome], cyperus [tuber] boerhavia [root], sacred lotus [flower], martynia annua [fruit], vetiver [root]. Precaution: Do not use if safety seal is broken. 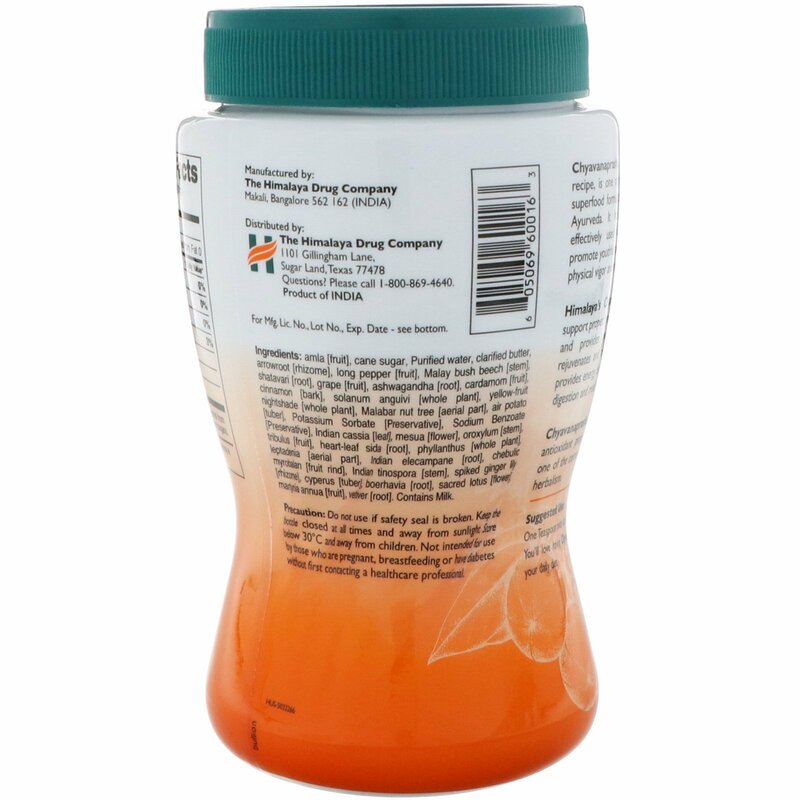 Keep the bottle closed at all times and away from sunlight. Store below 30°C and away from children. Not intended for use by those who are pregnant, breastfeeding or have diabetes without first contacting a healthcare professional. 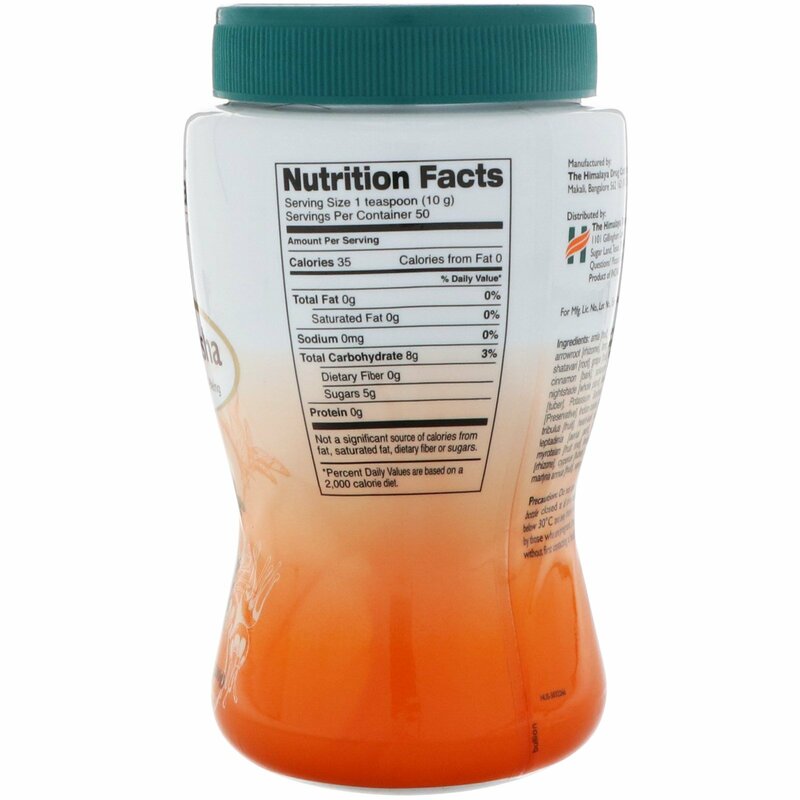 Not a significant source of calories from fat, saturated fat, dietary fiber or sugars.